Casa Feliz is a traditional colonial home located in the very heart of the Historic Center (Centro Historico) of San Miguel de Allende - one of Mexico's most picturesque and historic towns, just steps away from the theater, museum, library and famed square, El Jardin. Casa Feliz enjoys a reputation as one of the most popular of San Miguel de Allende rentals and is without question a preferred choice when considering Mexico vacation homes. 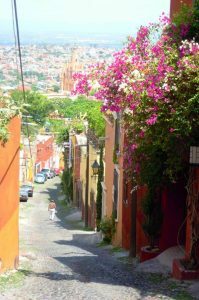 Visitors to this San Miguel de Allende vacation rental can enjoy all the comforts of home while easily exploring the town’s rich cultural heritage on foot. Step out of the front door onto the charming cobbled streets of a by-gone era. Shop in the neighborhood for Mexican crafts, clothes and foods, or sample the excellent fare of the many restaurants that offer a wide choice of international menus. Best of all, take an evening stroll in the delightful park - El Jardin - where Mexican families and visitors gather to chat and play, sample the tasty snacks offered by local vendors, and listen to the musicians who perform nightly under the stars. Enjoy the seasonal fiestas at one of the nearby squares or churches.